Brandi Raae: No More Pre-schoolers? I can't believe that in just a few short weeks, I will officially be baby, toddler and pre-schooler-free. I can't believe my "baby" is going to be 5! 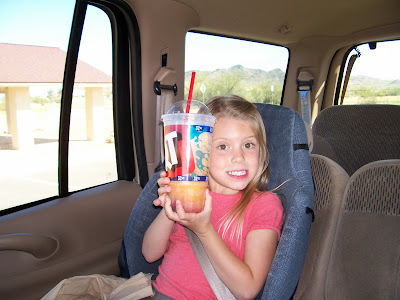 Just look how big she is--I mean, when you are big enough to pick out your own icee, operate the handle-thingy, and then pay for it out of your own quarters, nickles and dimes--you are BIG!!!! My happy and sad are all mixed up inside. It has happened that way with each child, but she's my last one. Wow, that's a feeling I just can't describe. I am over the moon about being able to have our special "girl time" as we call it--painting nails, shopping, sipping frappuchinos together--it's all amazingly wonderful. But, she's starting to bypass my room in the morning choosing to go downstairs with the boys instead of cuddle with me. (Don't get the idea that I sleep in like a lazy bum or anything--my kids are up at the first hint of a speck of sunshine.) Her voice sounds clearer, she can add small numbers and sound out words--she's growing up. I love it and hate it all at once. Thank goodness she can't do everything on her own yet! Thank goodness they grow just a smidge at a time, or I'd fall apart. I look forward to planning her Ms. Pac Man birthday party. She's gone from Sponge Bob, to Hello Kitty, to Barbie and the Three Musketeers to finally Ms. Pac Man. And I have to say I am thrilled, because after last year's super-duper difficult cake, Ms. Pac Man will be a cinch!! !